An entirely new level of comfort! The spacious Banks Outdoors Stump 3 Hunting Blind is constructed from durable polyethylene with a textured bark finish that keeps you completely hidden from wildlife. Its round design maximizes space and allows you to comfortably shoot in any direction through the large, silent-open windows. Plus, the heavy-duty steel base plate securely holds 4X4 posts (not included) for easy tower-style elevation. Note: This item is shipped by commercial carrier curbside. Unloading is the customer's responsibility, including off the back of the truck. This product ships in one box, measuring 66"l. x 66"w. x 96"h. and weighing approx. 350 lbs. No expedited delivery. High-value orders require a physical street address, otherwise insurance costs will be added to the shipping total. 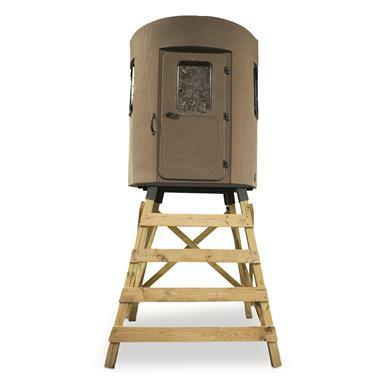 Door Dimensions: 54"h. x 26"w.
Window Dimensions: 22"h. x 14"w.
Banks Outdoors Stump 3 Hunting Blind is rated 3.0 out of 5 by 1. The safe, easy way to enter your blind!